Lorrie knits and sews: Olympic ravthlete, sock patterns, P is for, Q is for. Olympic ravthlete, sock patterns, P is for, Q is for. My socks qualified for a medal! !I misread the start time for the Ravelympics. They used Beijing time and I used US Eastern daylight time, also known as television time. It worked anyway. I'm putting the medals on my side bar. I used pearl buttons on my sheep vest, but today when I was putting the left over yarn away, I found something. I have sheep buttons!!! I finally have patterns for sale through Ravelry, hosted on my own website. I have 4 sock patterns listed, but one of them is not written yet. When it's written I'll put it up as a pdf. I've also learned how to edit my sewing business web site. It's always had a knitting page, which was blank. I'm hoping with a couple of extra days this weekend, I'll be able to make a pretty page and link to t he other page. 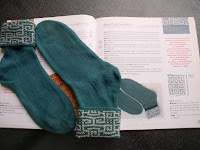 One of my first published patterns appears in XRX's Socks, Socks, Socks book on p. 15. I still have the socks. I bought the yarn at a house sale and made the socks to match my bowling shirt. There is ribbing under the mosaic cuff. The book was the result of too many good entries in a sock contest. The winners are in the book except there is no picture of the "Emperor's new socks". I'm not the family quilter, but DD Julie is. Last fall she made a quilt as a Christmas gift for her sister Jan. She showed a picture of the design at a quilt wholesale show and sold the design to Quilter's Home. The issue with the quilt is now on sale. The quilt went off for photography and Jan got a picture for Christmas. 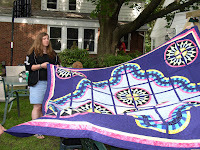 We had a family party July 4th and Julie had the quilt, but needed it for a trunk show. Did I say that she lives in another state? Jan's afraid to use the quilt when she does get it. Julie's web site is Quilted pleasures.